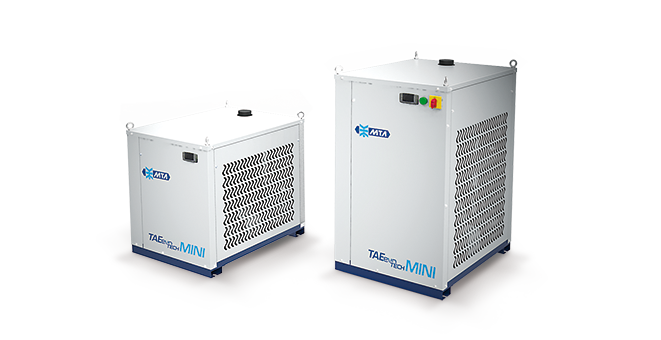 Developed from the TAEevo range experience, the TAEevo Tech MINI has been greatly improved through important technical updates: new finned coil evaporator, strong structure with eyebolts and new advanced electronic controls. Everything is a perfect balance between high reliability, compact dimensions and high efficiency. Perfect for cooling smaller industrial processes. The design of the MINI units combines the aim of ensuring class-leading performance with the highest reliability of the components. The innovative finned coil evaporator ensures reliable operation even in demanding applications. Thanks to the non ferrous hydraulic circuit the MINI chillers are able to work even with fluids aggressive to carbon steel, maintaining maximum quality and cleanliness of the process fluid. Thanks to their compact dimensions MINI units fit easily even below of a workbench. The robust structure with eyebolts allows lifting the unit by means of straps with hook. Thanks to the dual frequency design the MINI 03 model is ready for 50Hz and 60Hz applications. The rational layout of the components, the simplicity of the refrigerant circuit and the numbering of electric cables simplify the operations of checking and maintenance, which can also be performed with running unit. The disassembly of the condenser air filters for the periodic cleaning operations is facilitated thanks to the fastening system interlocking. The mod. M08-10 are equipped with a green light steadily on under normal operating conditions and red in alarm condition. The wide operating limits allow MINI units to operate even under the most extreme conditions. The maximum temperature water inlet and minimum water outlet are respectively 35°C and 0°C. TAEevo Tech MINI can operate with high ambient temperatures up to 45 ° C.